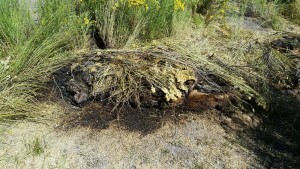 LINCOLN COUNTY, Nev. — A bull elk poached and left to rot in Lincoln County in August has the Nevada Division of Wildlife’s Operation Game Thief offering a reward for the poachers – and a Utah connection is strongly suspected. In the early morning hours of Aug. 29, two hunters illegally shot an elk on private property near the Pearson Ranch in Lincoln County. 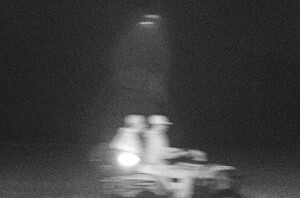 The poaching occurred using a spotlight, and the two men were captured on the landowner’s trail camera in a blurry photo riding an ATV. “We know there’s a witness out there who can tell us who did this,” Chief Game Warden Tyler Turnipseed of Nevada Wildlife said in a press statement. The poachers will be facing at least one felony and several misdemeanors, including shooting the animal at night and leaving the meat to waste. Operation Game Thief is offering a $2,000 reward to assist in the arrest of the shooters. “There’s reason to believe that this poaching case might have a Utah connection,” Mark Hadley of the Utah Division of Wildlife Resources said in a news release. Any information regarding this crime should be reported to the Operation Game Theft Nevada hotline at 800-992-3030. Callers can remain anonymous when reporting. These two “hunters” look awfully close riding together, I bet they know each other all too well. Poachers are somewhere between grave robbers and pedophiles.